Ross County winger Michael Gardyne is grateful to Staggies co-manager Steven Ferguson for another chance with the Staggies, but has no regrets over his initial decision to leave for today’s opponents Dundee United. Gardyne left County in 2012 to join United but following a bright start to his Tangerines career, Gardyne fell out of favour under manager Jackie McNamara. Following a loan stint with Kilmarnock, Gardyne was farmed out once again in 2014 when Ferguson brought him back to Dingwall during a previous interim spell in charge. Gardyne was signed permanently by Jim McIntyre the following summer to mark a fourth spell at Victoria Park for the 32-year-old. Despite finding a route back to the Highlands, Dundee-born Gardyne does not look back on the move to his hometown club with regret, adding: “It was definitely the right move, with my personal situation at the time. “The first season was great under Peter Houston, but then Jackie came in and I just don’t think we really saw eye to eye, to be honest. “It was Steven Ferguson who actually brought me back here after Derek Adams was sacked, and now he’s the manager. It’s the weird way it turns out. County and United are both locked on 11 points, with the Tangerines ahead on goal difference, and Gardyne feels his side are in the midst of a crucial spell. He added: “We’ve got a couple of big games coming up. We had Caley Thistle last week, now we’ve got Dundee United and Partick Thistle. “It will be hard at Tannadice, it’s not an easy place to go. They have won their last couple of games, they seem to have that feel-good factor back. “We just need to keep doing what we are doing and look forward to the game. It’s a good place to play – a good pitch and a great stadium. “The fans are good when they’re doing well, although not so much when they’re not. 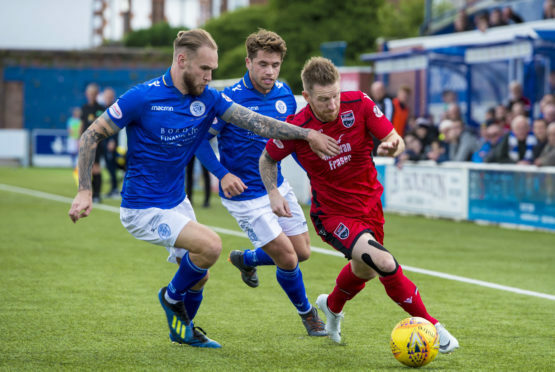 County have recorded successive goalless draws against Queen of the South and Caley Thistle ahead of today’s match, and Gardyne is determined to find the path to victory once again, adding: “We didn’t concede last week, but we just need to make sure we are more clinical at the other end. “The point against Caley Thistle could be important, but we go into every game looking to win it.